A couple of nights ago, beloved and I had dinner at Oma. Oma is a semi-Filipino bar and restaurant at one of the junction streets of Tomas Morato. Why I call it semi-Filipino, read on. Anyway, Beloved has been bugging me to go here after learning the names of the two soups in their menu. However, every time we pass by, it’s either under renovation, closed because it’s a Monday, or still not open because the sun’s still up. Finally, after deciding to eat at Burger King, we happen to pass by and see it open so took the opportunity to do so. Why I call Oma a semi-Filipino bar and restaurant is because they have either your Filipino favorites such as sisig and Pinoy stews such as sinigang, adobo, caldereta, et cetera, or your usual bar menu such as finger foods, pasta, and pizza with a Filipino twist. 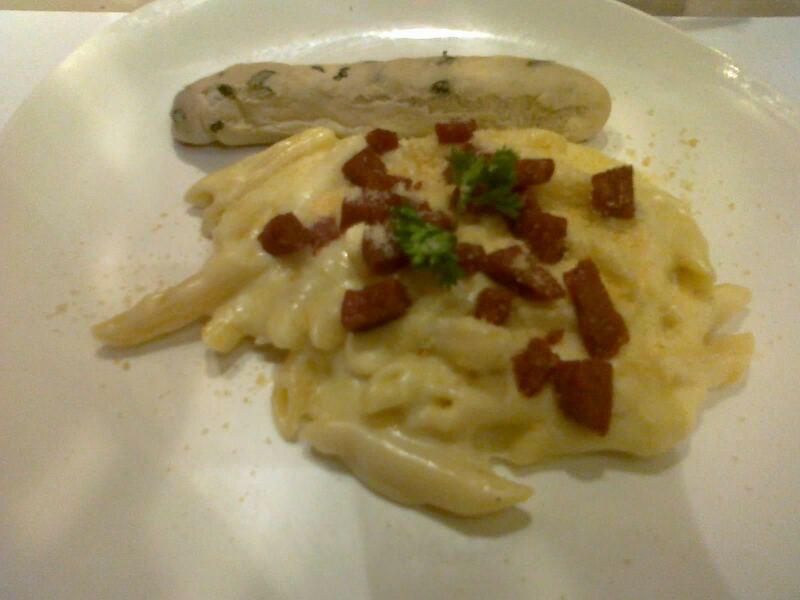 The Filipino twist usually comes with the use of kesong puti, specifically in their pasta and pizza. If that’s not enough, they also name their menu items with common Filipino first names. Also, because this was a bar, I expected elevated prices from your usual restaurant. Beloved was somewhat disappointed in learning that they replaced one of the soups, Iñigo, to a different one. Also, the other soup, Ramon, although was still in the menu, wasn’t available the time we went. So, yes, we didn’t get to order my entire first name. We did learn that half of Beloved’s first name was available in a form of pasta, so we got that: an order of Paulina (255 Php). 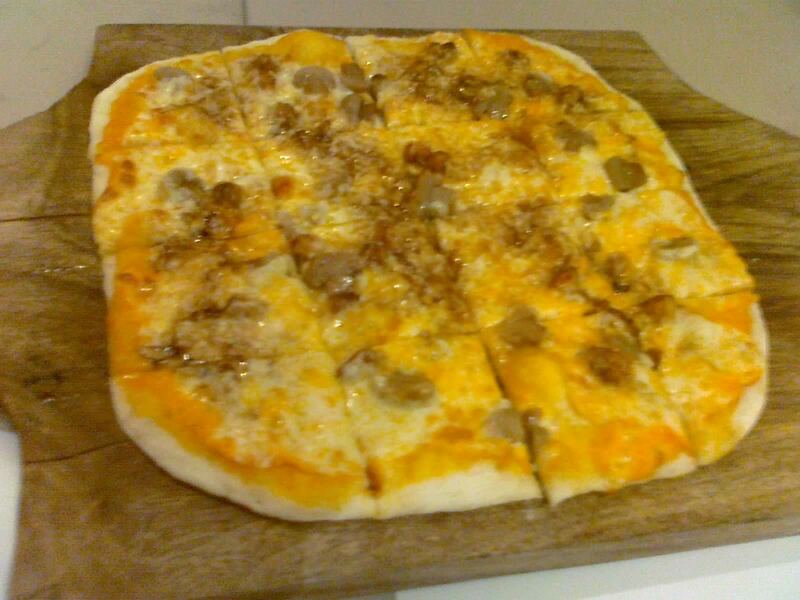 In addition to that, we also got a pizza: one Clara for 320 Php. For our drinks, because we weren’t really much of drinkers, just got ourselves a couple of glasses of Bottomless Iced Tea for 60 Php each; no cute or silly names here. The drinks came first, and was pretty good compared to the usual iced tea, but I’ll skip that. The pizza came after a short while, and it arrived on a chopping board similar to what you would see in a wet market. Clara’s Filipino twist to the usual pizza was that it had shrimp cooked gambas style. That meant the mushrooms and garlicky bits of shrimp over a layer of mozzarella cheese. There wasn’t much toppings, which I actually like. And I’ll admit the toppings were great tasting. The crust wasn’t that bad too—it was a thin, crunchy, almost pita-like one. The downside of this dish was the price. It wasn’t really a huge pizza, even though the number of cuts might make it look a lot. Again, bar prices. Paulina was an even more dismal serving than the pizza. It was a 220 Php plate barely good for one. The Filipino twist in this dish was that they used kesong puti in addition to cream cheese and mozzarella. The black bits on top was cubed spam, which isn’t much to write about. Again, I’ll admit that the pasta was great—the kesong puti gave it a slightly tart taste, and the medley of the cheeses made it extremely creamy. However, again, the bar prices doesn’t really make this dish worth it. So I guess this would probably be a one time adventure to sate our curiosity. We didn’t get to try Ramon and Iñigo which was basically the only reason why we, well… Beloved at least, wanted to try this place out. Because this is a bar, they probably have some great cocktails and other alcoholic beverages (don’t take my word for it though). They probably take advantage of the fact that people would splurge more on bars, explaining the prices of their food. I’ll admit that their dishes are one of a kind and pretty good tasting, in addition to having silly names. However, as I’ve repeated over and over again in this review, the bar prices just doesn’t cut it for me. In addition to that, while I don’t really care much about the ambiance of the place, the tables were crawling with ants. Although it didn’t really bother us that much, that’s still another reason to stay away. I still have an inkling that Beloved would force me to come back here, simply because we didn’t get to try out the soup. Personally, I’d stay away; you’re not missing that much. Not recommended for: Impoverished Iñigos. Smart nomnomnom tip: Make sure you have at least 500 Php per head, just in case.